Midnite Oils is a small family owned business since 1998. We are located in the small town of Cornelius, Oregon just west of Portland. We are a family of very talented artists, Dorie Horne, Bruce Horne, and Andy Bachmann. All of our products are uniquely handcrafted in small batches and are produced by family members. DORIE HORNE - is owner and founder of Midnite Oils. She has a B.A. in Art Education from Western Illinois University. 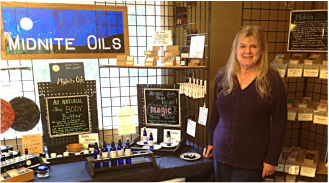 She makes and creates most of the soaps, lotions, massage oils, body butters and sunscreen. She also does all of the administrative functions (finance, inventory, ordering, etc.) from her home office. Dorie was the Executive Director of Care To Share (a local non-profit in Beaverton, Oregon founded to feed the hungry) for 13 years. She now volunteers at LoveINC (a local non-profit in Hillsboro, Oregon) whose mission is to mobilize the churches to transform lives. Dorie is constantly researching new products for Midnite Oils. ​BRUCE HORNE - is Dorie's spouse. Bruce has a B.A. in Art Education from Western Illinois University. He is responsible for product creation, orders, market set up and sales, shipping and supply purchasing. Bruce creates the perfume scents and is the master creator of "Magic"(muscle relief). ​This talented individual also is a producing artist showing his paintings and drawings in several Oregon galleries. ​​ ANDY BACHMANN​ - is Dorie's father (94) and lives with Dorie and Bruce. Andy is a WW II Navy Veteran who served in the South Pacific. He is the former owner of Overhead Door Company of Portland, OR and has fantastic business and accounting skills. Andy is a stained glass artist and has been making stained glass church windows, sun catchers, lamp shades and table decorations for over 35 years. He uses the copper tape and solder technique and many of his designs are original.